It’s the start of another year and for many of us that means time for an annual marketing refresh. Strategic planning is the best part of the job in my opinion. It’s our opportunity to be creative and to tap into a broad range of marketing experience. More than what our day-to-day routine calls for. As a social media manager creativity is everything in bringing together the right audience, with the right message, at the right time. And, we all know that timing is everything. That’s why I put together resources for marketers like myself who face the daunting task of building the… ANNUAL MARKETING CALENDAR. Here you’ll find planning tools from my Fandom Marketing Knowledge Center and great advice I’ve collected from other social media marketers to tackle your content strategy. Do you have a blog, Slideshare or library of white papers to pump out? It can be hard to keep up with when you’re flying by the seat of your pants. Feed the content machine with a well-organized editorial calendar. A good plan will include not just dates and topics; it can organize author assignments, SEO, social media distribution, and a running list of ideas. Get started with Fandom Marketing’s blog editorial calendar template. “I find it so helpful to organize your content calendar by topics or categories. At Qualcomm, we do this by product segment, as well as industry topics. Then, we create a calendar that balances all of the various topics we want to share content about. We leave room for real-time opportunities and adjustments along the way, which is really important for social media.” – Ashley Riggs-Zeigen, digital marketing communications, Qualcomm, Inc.
To Ashley’s point, it’s really important to leave room for real-time content in social media. It’s not a set-it-and-forget-it type of channel. Although, it’s amazing how much you can schedule in advance with good planning. 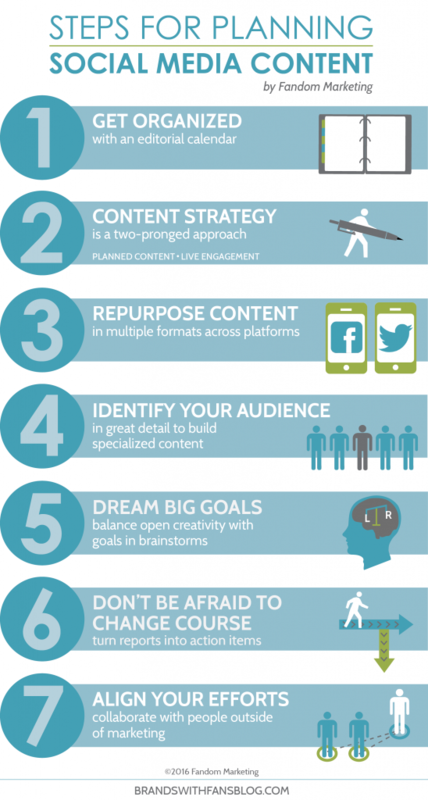 Building a social media content strategy takes a two-pronged approach. The first prong is planned content. These are usually topics important to your industry or company. It can include all of the things you know about in advance and would need to post anyway, such as a product announcement, sale, press release, or blog. If you know the launch date and have your talking points nailed down, it is easy to set-it-and-forget-it using tools like Hootsuite or Sprout Social. The second prong to a social media content strategy is live engagement. These are topics you can sometimes anticipate but more often happen unexpectedly. You can count on the Super Bowl buzzing February 7th. Yet, you might not have expected #Iowa to trend with 2,000 new Instagram posts within hours of Trump skipping the GOP debate to hold his own event down the street. This is happening as I write! And, I’ll just come out with it… I am watching the CNN livestream of the Trump show after losing interest in the Fox debate in just minutes. (THIS IS NOT AN ENDORSEMENT OF DONALD TRUMP FOR PRESIDENT) Glad I got that off my chest, now onto buzz more relevant to marketing. Without a crystal ball you could’t have known #IllNeverBeToOldTo would also be trending today on Twitter. It’s a great conversation to jump into for some products. Think theme parks, dessert and cereal. There’s no substitute for simply being present and engaging on social networks. We all know how much time investment is put into blogging and other long format content. I always underestimate the effort because I am a stickler for quality. With so much investment, there’s no reason you shouldn’t be stretching the value of a blog. Consider ways to repurpose it into other formats when creating your social media content strategy. People are special. Each person wants to be treated that way. When someone arrives on your website or sees your message fly by in their newsfeed, it essentially has seconds to capture their attention. One good way to do that is with specialized content. Get to really, really know your audience and what they identify with. If they can find something familiar, delightful or useful in what you’re offering in a split second, you have a shot at turning them into a customer. Generic messaging to catch broad audiences can disconnect people from the message. Why? Because we’re special. I know you’ve heard it before… start with a goal. Start with a goal! Planning without goals can feel like walking in the dark. It’s absolutely necessary to have goals and measurable data points behind a strategy or well, it’s not really a strategy. At the same time goals can hinder creative thinking. If you’re brainstorming set all barriers aside and just dream big. Share data on what has worked in the past and ways users interact with your site or content to get the ideas flowing. The strategist can take all of the best ideas to form a cohesive plan. This will include a measurement plan around your big idea listing out goals, tactics, and measurable data points for user actions to benchmark. Without metrics, there’s no benchmark to measure success by. And without creative ideas, there’s no path to reaching a goal. It’s all about balancing of left brain and right brain. There’s nothing worse than sticking to a strategy for a year that isn’t working. I bet you’ve heard the marketing buzzwords “actionable insights” right? It can get thrown around casually in reporting conversations, yet it’s serious business. The purpose of measuring marketing efforts is to learn what’s working and not working. The best ideas on a white board can fall flat in execution. As marketers, we have to make assumptions about how people will act and what matters to them to some degree, or we’d never get anything done. This is where actionable insights come into play. Don’t just report. Turn reports into action items. Sometimes that means small tweaks to test changes to your approach, like topics or photography. Sometimes that means trashing a strategy and taking what you learned into a different approach. It’s OK if your report reveals weaknesses in your strategy. Face it head on. The one thing you can really get wrong is not changing course when you should have. Believe me, I’ve been there. Are you collaborating with people outside of marketing? It’s easy to think inside the box when you live in a box. Get out there and talk to other people in the company who hold positions other than marketing. You’ll get a broader understanding of the business while gaining a detailed picture of the customer experience. These conversations will turn into content ideas, policy changes, and bring you steps closer to a true integrated marketing experience. Annual strategic planning is your time to get creative and reset your path for the year ahead. Start your planning by downloading our free editorial calendar template and 2016 marketing holidays calendar. As you plan blog topics you can stretch the value of content by repurposing them into multiple formats. Hold a no-barriers brainstorm and talk to people outside of marketing to get out-of-box ideas flowing. Taking everyone’s ideas into consideration you can mold a strategy with goals and metrics around the best ones. Use benchmark reporting to track the success of your strategy and most importantly, don’t be scared to change course if it’s not working. Take action on reporting. With these smart tips and resources now in hand, I hope that ANNUAL MARKETING CALENDAR sounds less daunting.